For superior, consistent damping performance and smooth, steady ride quality, trust OSC Automotive’s shock absorbers and strut assemblies. "OSC Automotive Shock Absorber and Strut Assembly --. OSC AUTOMOTIVE SHOCK ABSORBERS AND STRUT ASSEMBLIES. "AC Delco Shock Absorber and Strut Assembly --. Series : AC Delco Professional. Type : Strut Assembly. Therefore all implied warranties that may apply to your part are limited to the duration of this written warranty. "AC Delco Shock Absorber and Strut Assembly --. Includes spring, strut, strut cushion and upper strut mount. Type : Loaded strut. Upper mount style : Strut Upper Mount Style. Notes Location : Front, Passenger Side. Trending at $158.16eBay determines this price through a machine learned model of the product's sale prices within the last 90 days. "AC Delco Shock Absorber and Strut Assembly --. Type : Shock Absorber. Therefore all implied warranties that may apply to your part are limited to the duration of this written warranty. Each warranty gives you specific rights, and you may have other rights which vary from state to state. 4 Pcs Full Set Front & Rear Shocks Struts Absorber For 2006-2010 Chevrolet HHR. Chevrolet Cobalt 2005-2009Exc. SS 2.0L Models. Chevrolet HHR 2006-2010Exc. Front Left & Right. Rear Set & Full Set. Fits Chevrolet Chevy HHR 2006 2007 2008 2009 2010 06 07 08 09 10 11 Excludes SS. 2011 Chevrolet HHR All All. 2010 Chevrolet HHR All All. 2009 Chevrolet HHR All All. 2008 Chevrolet HHR All All. New Complete Strut Assemblies Pair. * ITEM FEATURES: 1. Fits Vehicles of the Following Years and Make : Year Make Model Fitment 2005-2010 CHEVROLET COBALT ALL TYPES 2006-2007/2011 CHEVROLET HHR ALL TYPES 2008-2010 CHEVROLET HHR LS-LS PANEL-LT-LT PANEL 2005-2006 PONTIAC PURSUIT ALL TYPES 2007-2009 PONTIAC G5 ALL TYPES 2. Guaranteed Exact Fit for easy installation 3. 100% BRAND NEW and tested to meet or exceed OEM specifications 4. Premium ISO/TS 16949 quality - guaranteed highest quality available 5. Engineered for superior durability, backed by industry leading warranty. "Unity Shock Absorber and Strut Assembly -- - - ". Series : Unity Shock Absorber and Strut Assembly. Type : Loaded strut. Notes FWD, Location : Front Driver and Passenger Side. Quantity sold : Set of 2. 4 New KYB GR2 / Excel-G Shocks Struts. Will Fit: Chevrolet Cobalt 2005 2006 2007 2008 2009. Color of shocks / struts is black. 2006-2011 Chevrolet HHR 2.2L 2.4L. 2005-2010 Chevrolet Cobalt 2.2L ( NO SS or Turbo Models ). It will fit the following makes and models 2007-2008 Pontiac G5 2.4L. 2007-2009 Pontiac G5 2.2L. 1x Part# 1332356L 11601 - Front Left Spring Strut. "AC Delco Shock and Strut Mount --. Series : AC Delco Professional. Notes Contains Bearing, Location : Front. Location : Front. Therefore all implied warranties that may apply to your part are limited to the duration of this written warranty. Go pro with Protier. In order to ensure that you get what you want, the Protier family has created such a team where we cater to each and every one of your technical needs. Each part is reversed engineered to be identical to or exceed the OEM design. 2006-2011 Chevrolet HHR. 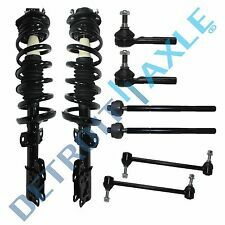 Complete Strut Assembly includes strut, coil spring, strut mount, boot, bumper kit, spring seat and isolator. 2005-2010 Chevrolet Cobalt. 1x Front Right Suspension Strut And Coil Spring Assembly. "Monroe Shock Absorber and Strut Assembly --. MONROE – QUICK-STRUT ASSEMBLY SET. Premium strut, coil spring, bearing plate, spring isolators and more included ". Series : Monroe Quick-strut. Type : Loaded strut. "Monroe Shock Absorber and Strut Assembly --. MONROE – OESPECTRUM PASSENGER CAR SHOCK ABSORBER SET. Type : Shock Absorber. Series : Monroe OESpectrum passenger car. 2 Shock Absorbers. Notes FWD, Location : Rear Driver and Passenger Side. • OSC has designed our Qwik-Fit™ Strut Assemblies for quick & easy installation, no need to take apart the original strut assembly. FITS: 2006 2007 2008 2009 2010 2011 06 07 08 09 10 11 Chevrolet HHR. 2006 CHEVROLET HHR. 2008 CHEVROLET HHR LT Panel. 2008-2011 CHEVROLET HHR LS Panel. 2008-2011 CHEVROLET HHR LS. 2008-2011 CHEVROLET HHR LT. Monroe uses advanced engineering and test capabilities to provide product reliability, endurance and performance. "Monroe Shock Absorber and Strut Assembly --. Maintain a smooth, steady and comfortable ride in all driving conditions with the sturdy build and patented Twin Technology of Monroe’s OESpectrum strut assemblies. 2X Monroe Quickstruts Front Complete Struts. 2X Front Sway Bar Links. 2X Monroe OEspectrum Rear Shocks. IMITATED, BUT NOT DUPLICATED! �Premium strut technology specific for each application to optimize each vehicle�s unique ride and handling characteristics. 2006 CHEVROLET HHR. 2008-2011 CHEVROLET HHR LS;. 2008 CHEVROLET HHR LT Panel;. 2008-2011 CHEVROLET HHR LS Panel;. 2008-2011 CHEVROLET HHR LT;. Monroe uses advanced engineering and test capabilities to provide product reliability, endurance and performance.